Mike Bloom is a Houston, Texas artist and received his B.S. degree from Stephen F. Austin State University in 1959, where he was commissioned to illustrate the Botany manual for the Department of Biology. He did a year of Graduate studies at the University of Southern California, followed by two tours of service in the U.S. Army. Gallery of American Art - Shreveport, LA. Mike has worked in numerous mediums and styles throughout his life, arriving at his current creative style focusing on traditional and nontraditional acrylic, enamel and mixed media paintings. Mike's use of vibrant colors, taking many shapes, make his paintings come to life with a dramatic burst of intensity. Mike’s works hang in the homes of private Collectors in the U. S. and Mexico. Please enjoy browing through the site. It is updated frequently, and the newest works added will appear on the last pages of each category. 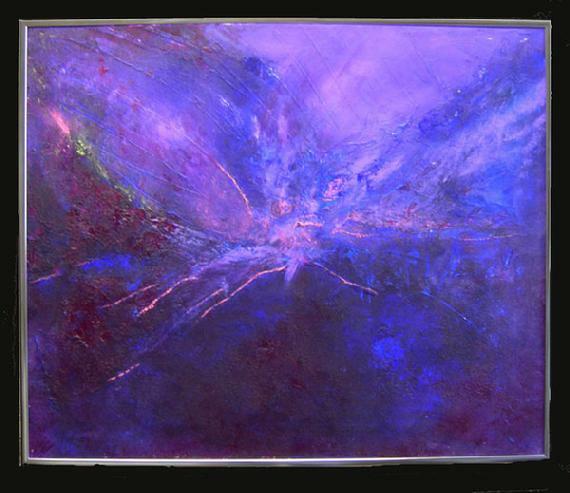 My use of acrylic and enamels on canvas and plexiglas reflect both experimentation and abstraction. The manipulation of vibrant colors explode on my backgrounds of raised and varying matter. I employ the use of 'accident' in my work to accomplish a strong and sensual appeal. Someone once said 'control should be avolided as much as possible. The hands should become the tools of destiny and the eyes should become silent witness'. International Society of Experimental Artists, Inc. The Allied Artists of America, Ltd.